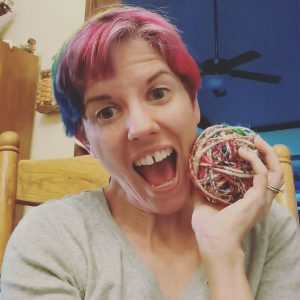 At the end of September, I let you all know my thoughts on Darn Good Yarn of the Month, a yarn subscription service. I told you about the yarns I received in my first three months of membership, as well as the patterns and bonus gifts. Today I’d like to follow up with my most recent Darn Good Yarn of the Month, and my experience knitting the pattern included in my box. Let’s get to it! I bet you can’t tell how excited I was to receive my Darn Good Yarn Confetti Cake. This yarn is 45 yards worth of wool and silk blend, as the name suggests. In the hank it has a pleasantly woolly texture, kind of like when you’re stroking a sheep. The yarn came with a pattern for a herringbone headband and brightly colored stitch markers. What I love most about the yarn is its beautiful colors. The DGY spinners did an amazing job making a lovely yarn that just pops with bursts of color. The “confetti cake” in the name is well-earned! 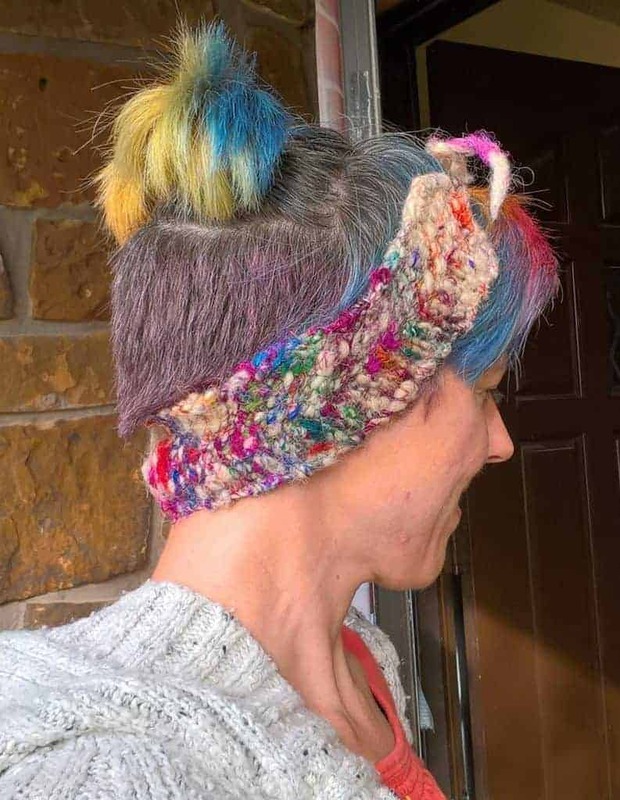 The designer of this headband pattern clearly intended to take advantage of the woolly warmth of this yarn to create a headband that would keep your ears nice and toasty in the winter. One thing I will say, right off the bat, is that I don’t know if a herringbone stitch is the best way to showcase this particular yarn. I felt like the herringbone texture got a little lost in the many colors of Confetti Cake. The next point is that I think I did myself a disservice by insisting on sticking with the US 10.5 needles I used to knit the headband. I’m a tight knitter, and I think using size 10.5 made the process of knitting this pattern more difficult than it needed to be. I really should have moved up to size 11, and maybe even size 13. As more proof that I should’ve moved up a size or two: the headband was a little short when I finished. If I wear it ties side down, it doesn’t reach my ears. So I wear it ties side up instead. I think it’s probably meant to be worn ties side down, and if I had used a larger needle, it probably would’ve been longer. The colors burst even more than my hair! I still have half a ball left (again, more yarn that needed — I continue to love that about Darn Good Yarn! ), so I may well just try again with a larger needle. One thing I haven’t addressed yet is the actual feeling of knitting with Confetti Cake. It is a bit scratchier than most yarns I knit with. It isn’t as scratchy as knitting with Lopi Yarn (a very sturdy and durable Icelandic wool yarn that is probably as strong as iron), but it was definitely on the scratchy side. Complicating this scratchiness is the many bits of plant matter I found poking through the yarn as I knitted with it. And when I say “poking through,” I mean it. Those bits of plant matter frequently “poked” me so sharply that it hurt! I admit that at first I found this annoying. But then I remembered the note I received in my shipment, mentioning that Confetti Cake is spun by women in India (one of the many women that Darn Good Yarn employs in its yarn sourcing). That changed my attitude completely! The plant matter still poked me insistently, of course. But I used those little “pokes” to remind me of the women whose lives were changed and improved because they were able to spin these beautiful materials together to make yarn — and a living for themselves and their families. I decided that a little vegetation poking was a small price to pay for the pleasure of working with fair trade yarn. I mentioned already that I did try wearing my knitted headband. I wore it to my daughter’s final band contest last weekend, when the wind was biting and the air had chilled to the mid-40s (Fahrenheit). It definitely kept my ears warm! While the yarn is scratchy, here’s a helpful tip. 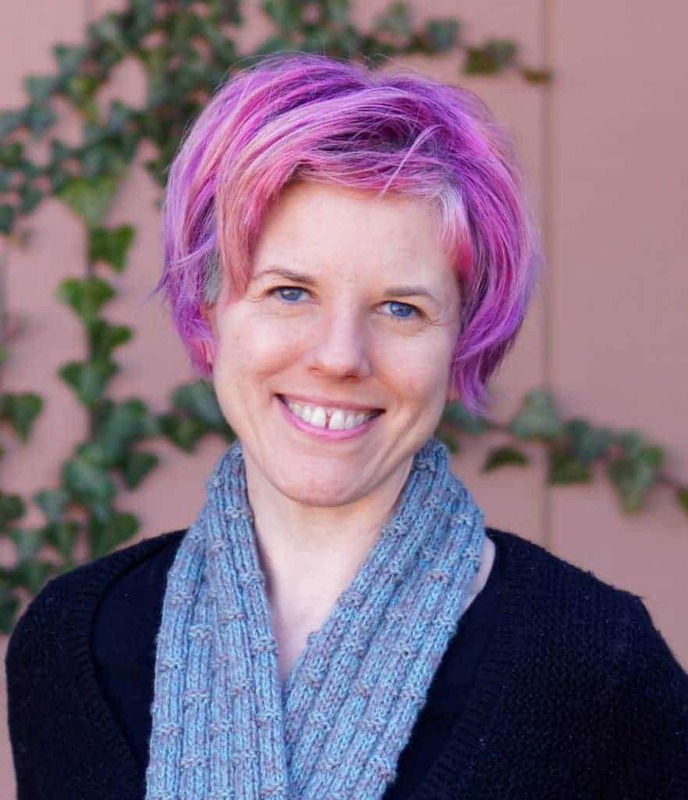 Give the knitted object a hair conditioner-infused bath. That makes the finished product feel much nicer. 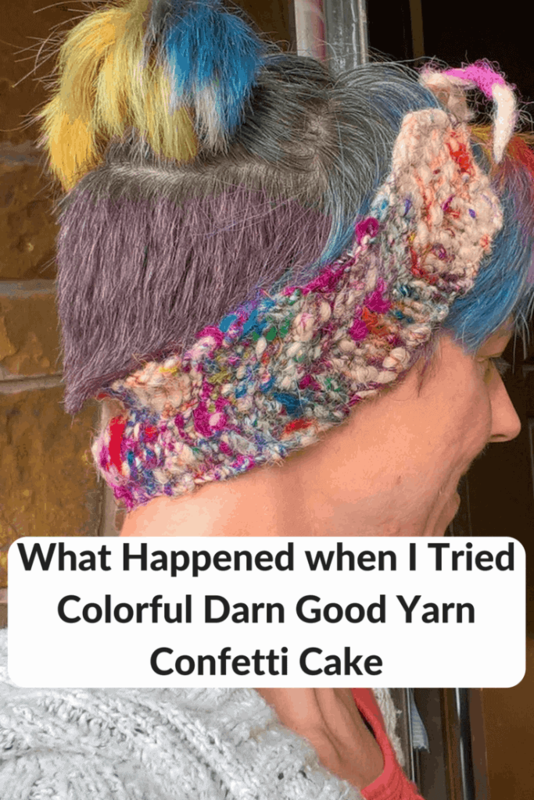 While I do prefer the softer Darn Good Yarns, I’m glad I got the experience of knitting with Confetti Cake. I learned some important lessons about gauge and using the right needle for your yarn (haha). I also learned that sometimes, enjoying a knitting experience is all about perspective. And I learned that wool and silk sure make a warm headband for chilly days. Are you ready to give Darn Good Yarn of the Month a try? I’d love for you to use my affiliate link to sign up for a subscription. If you make a purchase after clicking the link below, I may receive a small commission — but it’ll cost you nothing extra. Click here to subscribe to Darn Good Yarn of the Month!